Since I started my ministry here in Manila, one of our evangelism activities is City Jail Ministry. We started in Paranaque City Jail on June 2009. A few months later we went to the Makati City Jail. After a few months of giving Bible studies, the inmates accepted Jesus Christ as their personal Savior but the jail warden did not allow us to have baptism there. So we continued giving Bible studies hoping that someday we will be able to baptize the inmates. Thank God for finally answering our prayers. The newly assigned warden is open to beliefs of other denominations to hold baptism inside the jail. We were allowed to baptize the inmates who had accepted Jesus. 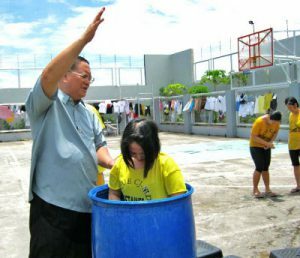 Last April 30, 2011 we had baptism in Makati City Jail and 34 inmates were baptized. 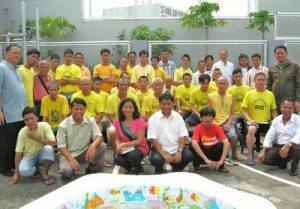 Today, May 14, we also had baptism in Paranaque City Jail and 42 inmates were baptized. The new warden assigned in these two city jails allowed the newly baptized inmates to have no unclean food in their meals and is allowing us to have worship on Sabbath day. Praise God, He heard our prayers! Our church members are very happy because God let His message reach the inmates. Now we will have nurturing program to our newly baptized members in these two city jails. I thank God for allowing me to lead the church members in this jail ministry. Besides our jail ministry we also have Bible studies and seminars in the church to equip the church members more in doing evangelism. To our sponsors, thank you for your trust on me and your prayers for my ministry here.